FedEx extended its position as the world’s busiest freight-parcel carrier in 2017 (see table at end of article), while Emirates maintained its lead in terms of pure cargo despite Qatar Airways rapidly closing the gap on its Middle East rival. 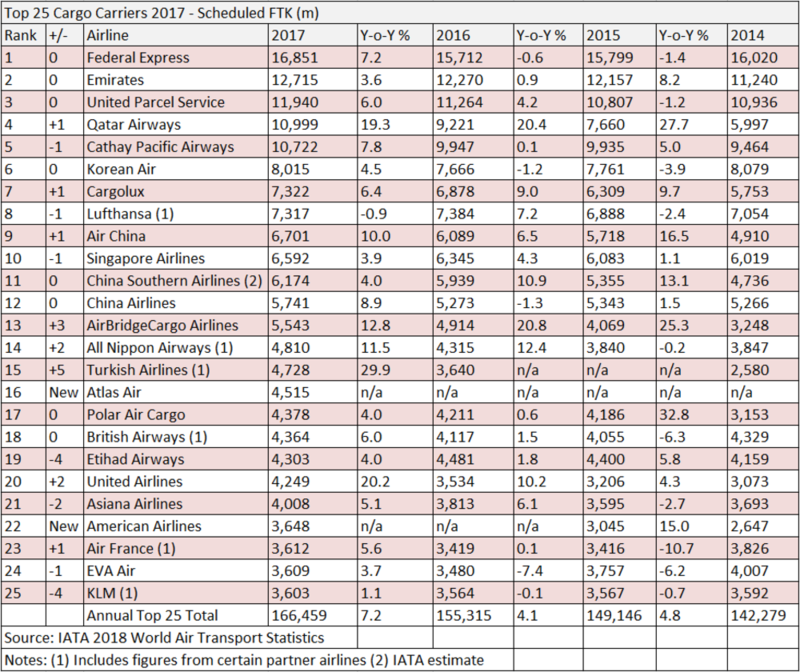 As expected, the latest figures from IATA’s World Air Transport Statistics report shows that the vast majority of carriers in the top 25 list recorded an increase in cargo traffic last year as the sector enjoyed a boom in demand. Overall, the top 25 carriers saw cargo traffic increase by 7.2% year on year to 166.5bn scheduled freight tonne kms (FTK). FedEx was again the busiest cargo carrier as it recorded a 7.2% year-on-year increase in cargo traffic to 16.8bn FTKs. In its full-year results, the express operator said that its performance had been boosted by the $4.9bn acquisition of TNT Express in the middle of 2016. Looking ahead, FedEx appears to be preparing for further growth in its air volumes. In the middle of last year it placed an order for 12 Boeing 767 freighters and 12 B777 freighters, with a combined list price value of $6.6bn. The B777Fs will be delivered between fiscal 2021 and 2025. The B767Fs will be delivered between fiscal 2020 and 2022. The second busiest airline, and topping the list of cargo carriers, was Emirates, which recorded a 3.6% year-on-year increase in demand to 12.7bn FTK. Percentage growth at the airline was one of the lowest of the top 25, a reflection of a slowdown in arrival of new aircraft at the airline and also a slowdown in demand growth for Middle East carriers. “Having not seen the strong upward demand of other regions in the first half of 2017, Middle-Eastern carriers’ share of global demand dropped for the first time in 18 years,” IATA said in its annual market wrap-up. Another express operator occupied the third step on the podium as UPS registered a 6% increase in traffic to 11.9bn FTK. UPS said that its US domestic business had benefitted from structural changes to the direct-to-consumer market, which saw strong growth in next-day air shipments as consumers selected faster delivery options. Meanwhile, its international segment saw export shipments surge by 16% per day. Like FedEx, UPS is preparing for future expansion; in February last year, the express firm ordered an additional 14 Boeing 747-8F cargo jets and four B767F aircraft to provide additional capacity in response to demand growth. This comes on top of an order for 14 B747Fs placed in 2016. Next up is Qatar Airways, which posted the third highest growth rate of any airline. The rapidly expanding Middle East carrier saw cargo traffic in 2017 increase by 19.3% year on year to 11bn FTK. This follows growth of 20.4% in 2016 and 27.7% in 2015. It has ambitions to become the world’s largest cargo airline — excluding the express firms — and is now within 1.7bn FTK of current leader, Emirates. During the year, Qatar took delivery of two B747-8Fs and two B777Fs. This year it ordered a further five B777Fs. Cathay Pacific was the fifth busiest cargo airline as it saw traffic increase 7.8% to 10.7bn FTK. Despite this strong performance, it dropped down the list due to the rapid expansion of Qatar Airways. The fastest growing cargo carrier in 2017 was Turkish Airlines, which saw traffic increase by 29.9% to 4.7bn FTK. Last year, the airline took delivery of two B777Fs, while it has been rapidly expanding its passenger fleet in preparation for the opening of the massive new Istanbul Airport. It also has lofty ambitions and hopes to become one of the top five cargo airlines by 2023. It has certainly been making ground in recent years, jumping from being outside the top 25 in 2015 to number 15 on the list last year. Turkish Airlines kicked off this year with a confirmed order for three B777Fs, to be delivered in 2018, on top of the two it already operates. Lufthansa was the only airline to report a decline in cargo traffic in 2017, as it registered a 0.9% drop off in demand to 7.4bn FTK. While Lufthansa on its own may have seen a decline in cargo volumes during the year, it represents only around 68% of the overall airline group’s cargo volumes and when other divisions are included, the Lufthansa group in fact saw traffic increase by 5.8% in 2017. Tonnage – as opposed to FTKs – carried by the German airline was also up during the year, suggesting that the decline was due to cargo being flown over shorter distances, rather than less cargo being carried.